What is the asset pipeline? Why should I use it? Compiles assets: Converts CoffeeScripts, SASS, and other JS/CSS files into their compiled, optimized forms. Optimizes caching: Tags files with digests based on their content, to bust stale caches and ensure the right assets are served & used. These features implement best practices out-of-the-box, allowing developers to take advantage of the speed & cost benefits of CDNs, while avoiding the usual headaches that caching can bring. When a Rails application using the asset pipeline is deployed to a production environment, assets are precompiled using rake assets:precompile. Computes the file's digest (looks like an MD5 hash) based on its content. This unique hash effectively acts as a cache key. If its content has not changed, its hash will not change either. After the assets are precompiled and the server is started, the asset pipeline goes to work. In the diagram above, when a visitor requests an action that uses the asset pipeline via a helper like image_path, the pipeline will check the manifest file. It will attempt to resolve the logical path (photo.jpg in this case) to a digest version of that file. If the asset pipeline finds a mapping, it will serve the digest asset back. If the asset pipeline does not, it will attempt to find & serve a non-digest asset that matches the logical path. Since Rails applications running in development mode do not utilize precompiled assets by default, it will skip this process and look within app/assets & public/assets for the file instead. If your site uses lots of static assets or rich media, serving content from your webserver can be both slow and costly. In its basic form, the asset pipeline doesn't do much to address this, as it still serves assets off the local file system. It does, however, include asset host functionality, which allows us to specify an external host for all of our assets. Whenever an asset is requested, Rails will redirect the request of an asset to a CDN of our choosing. Just set config.action_controller.asset_host = "assets.yoursite.com" in your environment config file. The Rails server receives the request for /assets/photo-a6c9ef.jpg from CloudFront. However, the asset pipeline will not generate a request to the CDN for this particular URI (forming an infinite loop; yikes!) Rather, because /assets/photo-a6c9ef.jpg is not a logical path that exists within the manifest file, Rails will check for the file in the 'public/assets' folder instead, find it, and serve back public/assets/photo-a6c9ef.jpg to the CDN. 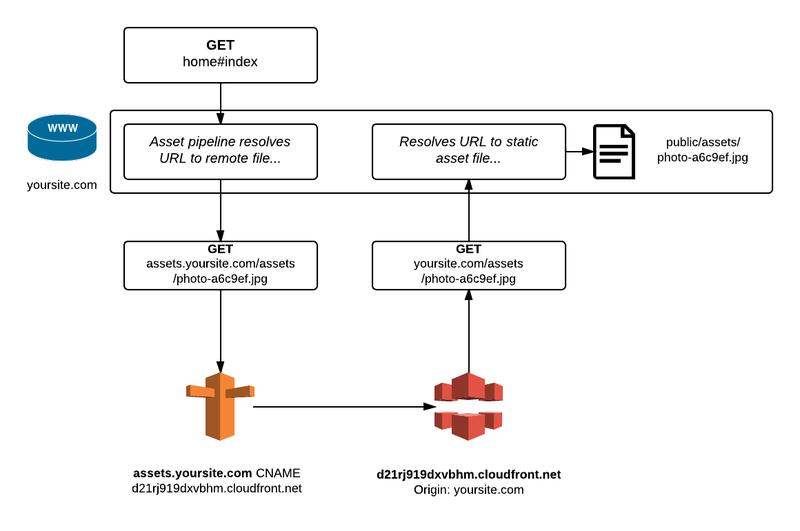 CloudFront caches the asset file (/assets/photo-a6c9ef.jpg) it receives from the Rails application, and returns a copy of the asset to the visitor who originally requested it, completing the process. 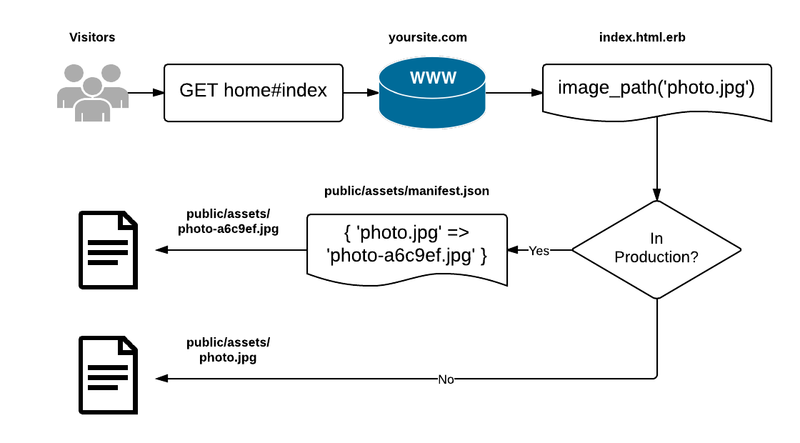 When another user visits home#index the future, steps #1-3 will occur, except CloudFront will have a copy of the file requested and serve it back immediately, skipping steps #4-5. As robust as this setup is, it is not without some pitfalls. When a file is cached by CloudFront, it has a tendency to cling to it tooth and nail, so you might find yourself with stale caches if you aren't careful with assigning unique cache keys. This is where the asset pipeline digests come into play; by effectively renaming a file every time its content changes, it prevents CloudFront from serving an old, cached copy of that file. Always ensure all files cached by CloudFront have a digest in their file name/url. If a file is accidentally cached without a digest, you can use CloudFront's invalidations to instruct it to delete its cached copy of a file. Keep note though; they can take about 10 minutes to complete, and Amazon limits you to 1000 invalidated files/month. You might find that after implementing this setup, custom fonts served through CloudFront render in Chrome, but do not render in Firefox. This is due to a policy that Firefox enforces, called Cross-origin resource sharing (CORS). When serving assets from another subdomain, the CDN, assets.yoursite.com, must set correct response headers to grant the application, yoursite.com, permission to use the assets. If the Access-Control-Allow-Origin field omits the 'http://', any subdomain (including 'www'), has multiple domains separated by spaces/commas, or appears multiple times, Firefox will reject the font. The only exception is that it may specify '*' to allow all sources. However, this allows anyone to use the CDN as a free font repository (at cost to you), so be warned. ...then restart the web server with apachectl restart. To verify its working, you can use an application (like hurl.it) to send a GET request to the web server for one of the assets, with Origin set to yoursite.com in the request header. Finally, CloudFront does cache response headers (e.g. 'Access-Control-Allow-Origin'). If the responses from the web server look good, but CloudFront cached the files without the appropriate headers, all the affected assets may need to be invalidated. The asset pipeline underwent a few important changes between Rails 3 to 4. Notably, during the precompile step, Rails 3 copies both a digest and non-digest version of a file to the public/assets folder. In Rails 4, it does not create non-digest files for assets by default. This means assets that do not use the appropriate asset pipeline helpers may show up in development and test environments, but will magically disappear in production. Be sure all assets utilize their appropriate helpers!